My newest pottery creations. One of the things I’m really enjoying about working out of a pottery studio rather than taking classes is that I can do stuff in my own time and it’s nice to see how I’ve progressed over the year. 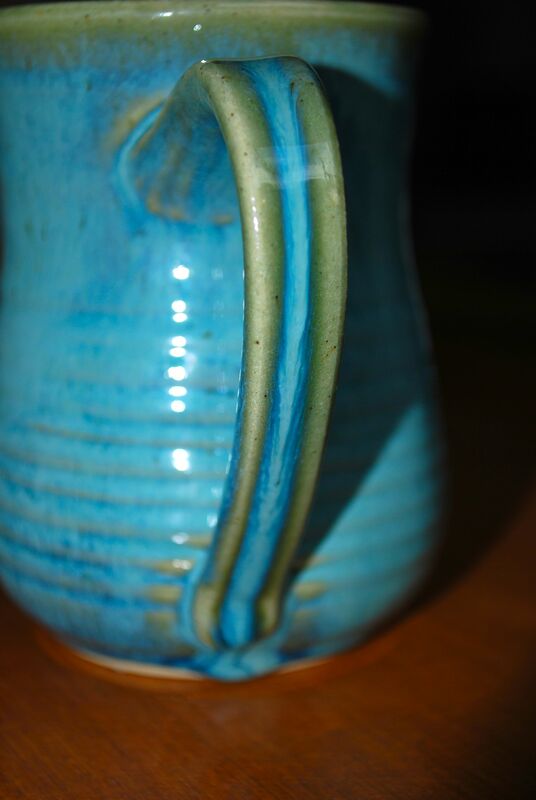 I haven’t made a huge amount of stuff, but the handles on my mugs have really started looking like good handles. You can see it in the picture of the four. The one at the back left is the newest handle. 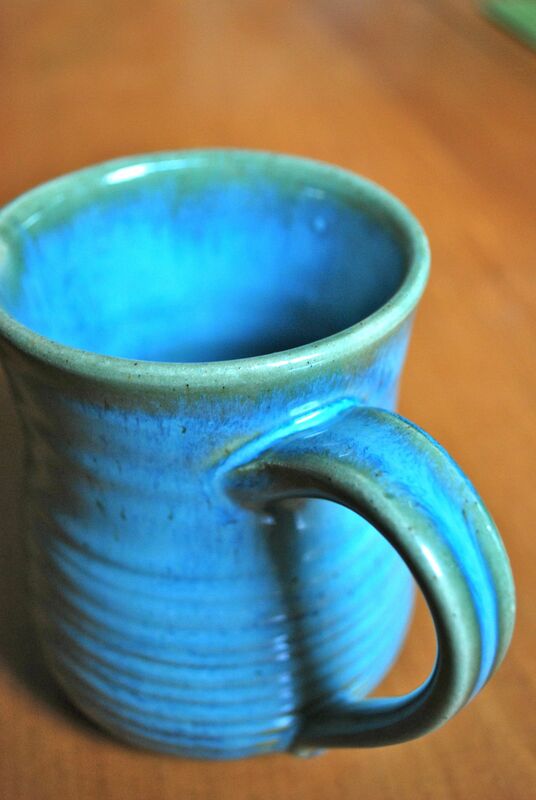 Also the greeny-blue mug is a new handle. I’ve started pulling them which makes a HUGE difference! 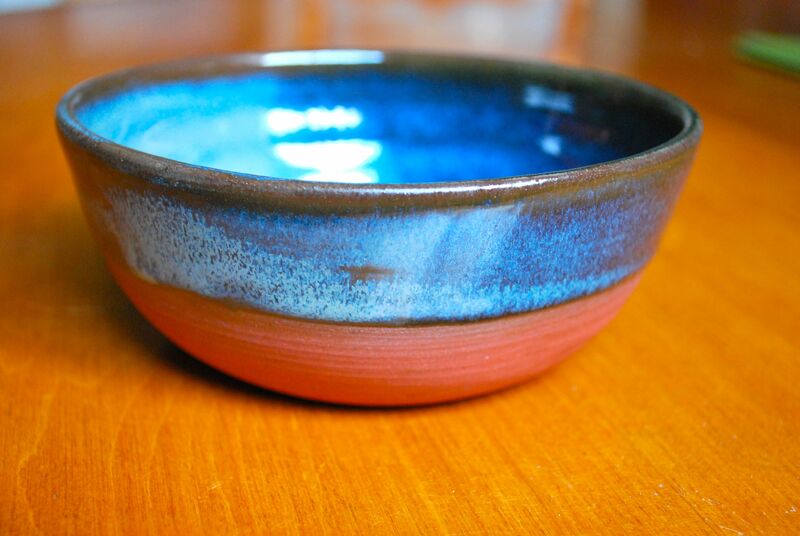 Bowl with a double dip of glaze made with red clay. I didn’t glaze the bottom half. This is the first time I’ve used this glaze. It’s called Cloud Blue. I love the way it ran down the handle. It’s my new favourite. I am in love with this mug. It was going to be a present (sorry Shannon), but I think it will instead be my new morning coffee mug. 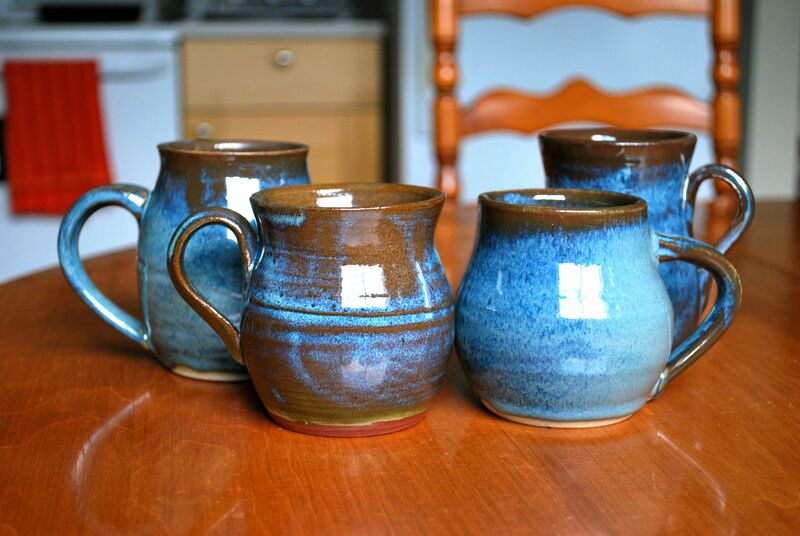 This set of four is half made out of red clay half out of grey clay, but all glazed with an Evening Blue glaze. It’s only one glaze that just has a really cool brown undertone. My previous favourite (as you may have guessed). Now outshone by Cloud Blue. I know I’ve said it before, but it’s always really exciting for me to get my stuff out of the kiln. I’m not great at knowing how the glazes will turn out, so it’s a surprise every time. When they come out looking good I just want to show everybody! !